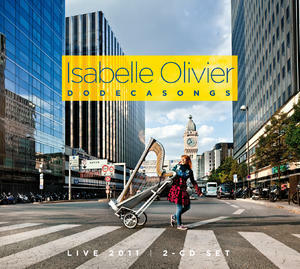 Isabelle Olivier - Isabelle Olivier "Dodecasongs"
Created in 2011 for Isabella Oliver's 20 years of stage performance. The idea is to explore an original repertoire of 12 original songs ranging from solo to Big Sea Band (octet), and through a new sextet composed by David Linx, Norma Winstone, David Venitucci, Michel Benita and Peter Erskine. Surprise guests, and sometimes other disciplines, can enrich both musically and textually the subject at hand. It is a project developed with each custom home site, then shared with the audience during a privileged moment. Finally, after 5 studio albums, the necessity and the pleasure of recording all these "Live" calls will keep the authenticity and uniqueness of the encounters experienced on stage. This record will be released on the label distributed by Harmonia Mundi ENJA.